Thanks for all of your help with my super serious problem. When I got to the store, the only colors they had in my size were navy, black, white, and…purple. Like really bright purple-y purple. They were pretty, but wouldn’t coordinate with my wardrobe very well. I waffled between the navy and the white ones for quite some time and the race was neck and neck for awhile but I finally brought in a heavy hitter: my nine year old daughter. It didn’t take her long to declare that the navy looked better on me and honestly, I was relieved that she chose that one because I secretly wanted it all along. Although, I will probably go back and get the white ones because they are just cute and classic. I have to admit though…these are some of the most UNCOMFORTABLE shoes I have ever worn. There is no arch support and very little cushioning in the insole. Loosening the laces helped, but ultimately I had to put my plantar fasciitis inserts in the shoes and that made a huge difference. I had hoped to take these with me on a trip this weekend where I’ll be walking around a lot (doing some sightseeing) but I’m not sure I could stand a whole day on my feet in these. At least not yet. you know, I’m at this point in my life if the shoes don’t make my massive feet look cute, I’m not putting up with uncomfortable. 🙂 Are they that bad? I never buy uncomfortable shoes! I thought that was only for heels and stuff anyway (which I don’t wear). Who buys uncomfortable casual shoes, and plans to go and buy another pair? I say find something more comfy which won’t damage your feet. Land’s end has look alikes and I bet they are far more comfy….and have support. I won’t pay $50 for something I am not going to wear a LOT! Oooo, I love Navy! Great choice. I’ve used “Super Feet” insoles in shoes like this and it makes a HUGE difference. And I feel for you on the plantar fasciitis – so not fun! 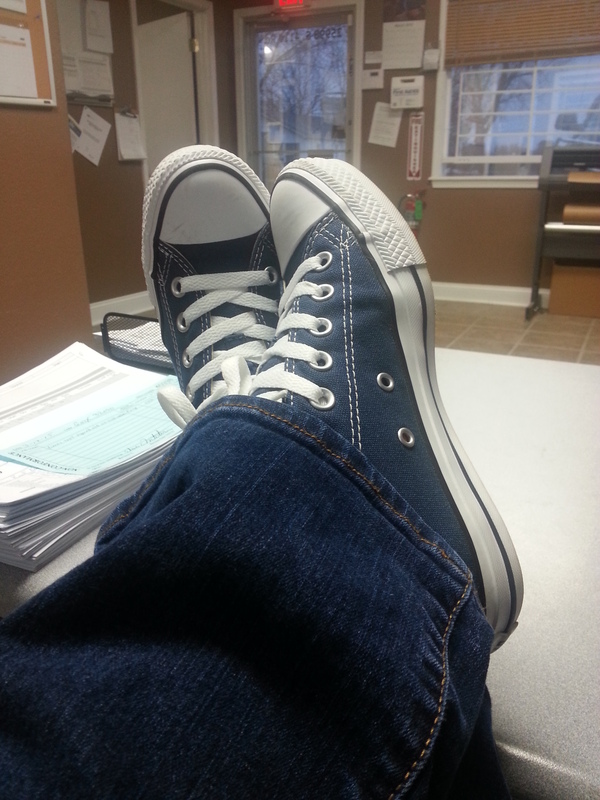 I love my Converse. I have a purple pair. They don’t hurt my feet much, but are definitely not for long walks. I like to wear them with dress pants and a blouse to work… I figure it gives me that ‘crazy librarian’ look. Either that, or I just look silly. Who cares! I’m at the age where comfort wins out every time over style. I do value my health and love walking as I think it is a great activity to do. However you do need good fitting and supportive shoes. Otherwise you are asking for trouble. prom, graduation, open house, etc??? it is that time of year and I remembered your oldest is graduating. How are you doing? Enjoying it all? I have had plantar fasciitis in the past so have to wear insole support now. But please don’t wear any shoes for long or medium periods of time if they hurt your feet. The shoes may stretch eventually but is it worth it?